This year’s winner of The Prince’s Rainforests Project (PRP) Award, Daniel Beltrá, has released some initial photographs taken on the first leg of his prize – a fully-funded assignment to document the three major rainforest regions of the world. March 20th 2009, Cristalino State Park, Alta Floresta, Mato Grosso (Brasil). 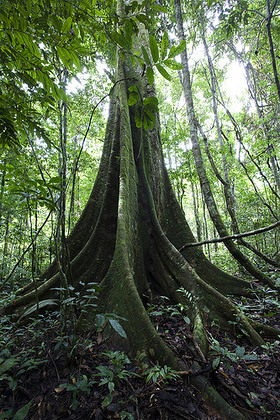 View of the rainforest canopy from the ground in in Cristalino State Park, Brazil. The PRP, founded by His Royal Highness The Prince of Wales, Prince Charles, recognises that every year, destruction of the Earth’s rainforests releases more carbon dioxide into the atmosphere than all the world’s cars, planes and ships put together and aims to achieve consensus about how the rate of deforestation might be slowed. The PRP is working with governments, businesses and non-profit organisations around the world to find solutions to deforestation – and to find them fast – with the ambition of ‘making the trees worth more alive than dead’. The project has also launched a global awareness campaign, asking people to sign up to put rainforests at the heart of the climate change debate. Sony and the PRP are delivering a stunning interactive exhibition that will combine Daniel’s new photographs to allow people to experience the glory of the rainforests and understand their plight. The exhibition will open at Kew Gardens, London on October 3rd 2009.